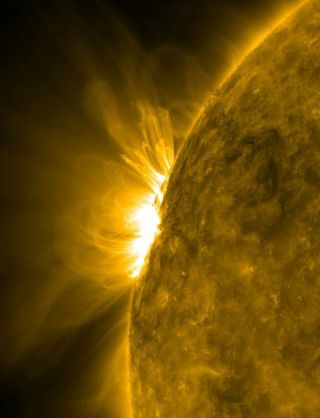 Unexpectedly powerful magnetic waves could help explain the super-hot nature of the sun's outer shell, researchers say. The sun's outermost layer, or corona, can reach temperatures as high as 3.5 million degrees Fahrenheit (2 million degrees Celsius), more than 20 times hotter than its surface, and blast out a wind of electrically charged particles traveling at hundreds of miles per second. All this activity requires energy, but what provides the energy has been a mystery. Now an international team of scientists has discovered these waves may be far more profuse and up to more than 100 times stronger than before seen, potentially delivering about 10,000 times more energy overall to the corona than ever detected. Using NASA's Solar Dynamics Observatory satellite to image structures and motions on the sun with about 540-mile (870-kilometer) resolution every 12 seconds, the scientists detected these magnetic waves throughout the corona. Their calculations suggest the Alfvén waves are capable of driving the solar wind and heating much of the corona. "These waves really do have sufficient energy to power a substantial fraction of the sun's atmosphere," study co-author Scott McIntosh, a solar physicist at the National Center for Atmospheric Research in Boulder, Colo., told SPACE.com. It remains uncertain how the magnetic waves on the sun transfer their energy to the matter in the corona to heat or accelerate it. In addition, the waves the researchers observed did not appear sufficient to account for the intense emissions of radiation from more-energetic regions of the corona. "We have work left to do with active regions," McIntosh said. Follow SPACE.com contributor Charles Q. Choi on Twitter @cqchoi. Visit SPACE.com for the latest in space science and exploration news on Twitter @Spacedotcom and onFacebook.